NEW YORK -- Pope Francis' call for a world free of nuclear weapons drew applause from across the United Nations General Assembly - including from Iranian Foreign Minister Mohammad Javad Zarif. Francis made the comments at the U.N. on Friday morning, his first stop in a daylong visit to New York. Friday morning, Pope Francis became the fourth pontiff to speak before the General Assembly. Read his full remarks. Francis praised the recent Iranian nuclear deal in his speech to more than 100 world leaders and diplomats, saying it was proof that political will and patience can bring about fruits. 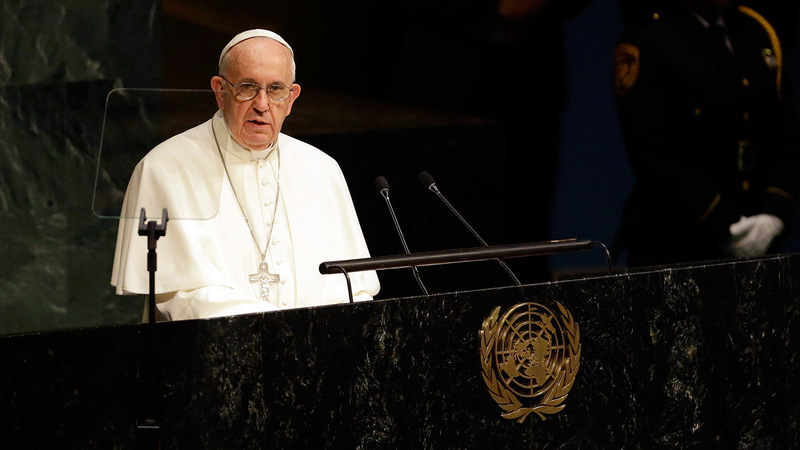 Friday, Pope Francis became the fourth pontiff to address the United Nations General Assembly. But Francis lamented that conflicts are raging elsewhere and that Christians and religious minorities, in particular, are being targeted. He called for a "grave summons" for world leaders to reflect on the innocents who are being slaughtered. Pope Francis is demanding respect for the sacredness of all life, in a reference to abortion. His comments are sure to please conservatives who have complained that he doesn't speak out enough against abortion. Francis made the comments at the United Nations on Friday. The Vatican has long objected to U.N. calls for access to contraception and abortion for women. In a speech to the General Assembly, Francis offered conservatives a lot to cheer: He called for a respect for all life and called for recognition of what he called the "natural difference between man and woman" - a reference to the Vatican's opposition to gender theory. He denounced what he called "ideological colonization" of the developing world - a reference to how ideas about contraception and gay rights are often imposed on poor nations as a condition for development aid. Pope Francis has asserted at the United Nations that the world's poor have a right to education, lodging, labor and land. In a speech before more than 100 world leaders and diplomats on Friday, Francis is demanding that the poor have immediate access to food and water, work and housing as well as religious freedom. Francis is speaking to the United Nations General Assembly on Friday during his first full day in New York. It's part of a three-city trip to the U.S.
Pope Francis has declared that there is a "right of the environment" and that humankind has no authority to abuse or destroy it. Francis made the assertion in a speech to the United Nations on Friday during his first full day in New York. Hoping to spur concrete action at upcoming climate change negotiations in Paris, Francis accused the world's powerful countries of a "selfish and boundless thirst" for money. He says that has led them to destroy the planet and impoverish the weak and disadvantaged. Secretary-General Ban Ki-moon says Pope Francis has made papal history by addressing the largest array of world leaders ever at the United Nations. The U.N. chief thanked the pope for demonstrating again his "remarkable global stature as a man of faith for all faiths." The gathering that starts shortly after the pope's speech is bringing a record 154 heads of state or government to the U.N. It's to launch an ambitious set of global development goals. 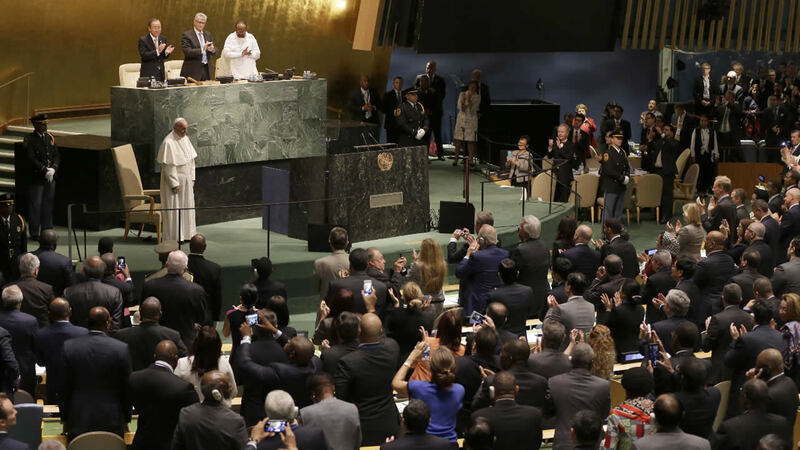 World leaders and diplomats filled the General Assembly chamber to hear the pope address representatives from its 193-member nations. Joining them were Microsoft co-founder and philanthropist Bill Gates and Nobel peace laureate Malala Yousefzai, the Pakistani education campaigner. Ban spoke just before the pope. He said the pope's message on climate change is critical as the world's nations approach a pivotal conference to address climate change in Paris in December. While others are at home in palaces with the famous, the secretary-general said the pope is at home among the poor and forgotten and with young people in selfies. Pope Francis has entered the United Nations General Assembly hall to applause. His stop at the U.N. is part of a three-city trip to the U.S. He arrived a bit early for his scheduled speech before the international body and stood in a corridor outside, chatting with Secretary-General Ban Ki-moon. Then his arrival was announced, and he and Ban walked into the crescent-shaped chamber together. The pope is sitting in a beige chair with a high back, where world leaders sit before they address the world body. Among those in the audience is Nobel peace laureate Malala Yousefzai, the Pakistani education campaigner who will be addressing the U.N. summit to adopt new U.N. development goals. It starts shortly after the pope leaves U.N. headquarters. Pope Francis has been meeting with the incoming and outgoing presidents of the United Nations General Assembly ahead of his speech to the world body. Francis' first meeting was with outgoing president Sam Kutesa, who is foreign minister of Uganda. He handed the baton earlier this month to Mogens Lykketoft, a former speaker of Denmark's Parliament. Francis is at the U.N. for a speech that will bring his message to an international audience. The president of the General Assembly presides over the 193-member body. The position rotates annually by region, and presidents are chosen by regional groups. Pope Francis is being driven to the United Nations General Assembly hall in an electric cart, past several dozen children singing a song and U.N. staffers cheering and shouting. Sitting next to Secretary-General Ban Ki-moon, he waved and smiled as someone in the crowd shouted: "Holy Father, holy Father - father to all. Thank you. Thank you." Earlier, Francis addressed 400 staff members chosen by lottery. He praised the staff for making possible many of the economic, diplomatic and political initiatives of the United Nations which are so important for meeting the aspirations of the world's people. He called them "the backbone" of the U.N. and urged them to send his greetings to staffers who lost the lottery. Pope Francis is thanking United Nations employees for work he says makes "possible many of the diplomatic, cultural, economic and political initiatives" of the world body. Speaking to about 400 staffers in the lobby of the U.N.'s New York headquarters, the pope praised the contributions of everyone from officials to cooks, fieldworkers to maintenance workers. He encouraged them all to "be close to one another, respect one another" and embody the U.N.'s ideals of a united human family working for peace and in peace. 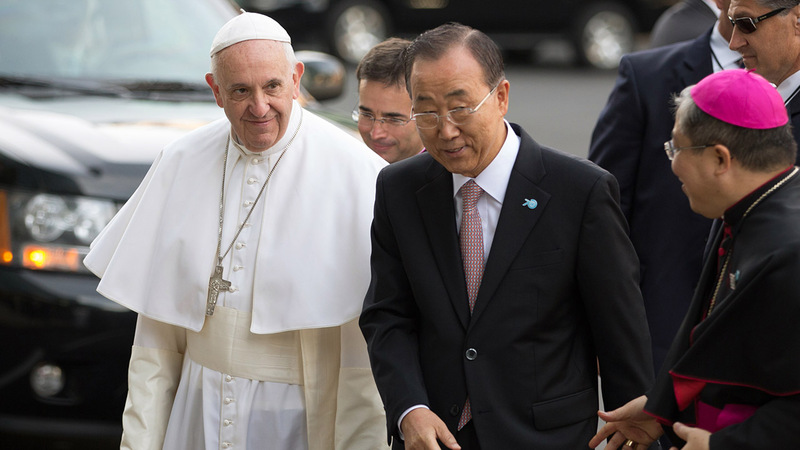 His visit marks the fifth time a pope has been to the United Nations. It's part of his three-city trip to the U.S.
United Nations Secretary-General Ban Ki-moon has welcomed Pope Francis to the United Nations, saying many draw inspiration from his "humility and humanity." He cites his call for global action on social justice, climate change and quality of life and dignity for all. He says: "Thank you for your spiritual guidance ... and love for humanity." The secretary-general and his wife, Yoo Soon-taek, met the pontiff as he arrived at the world body's headquarters in New York just before 8:30 a.m. While his visit marks the fifth time a pope has been to the United Nations, the Vatican flag was raised for the first time just before his arrival. The General Assembly recently agreed to allow the U.N.'s two observer states, the Holy See and Palestine, to fly their flags alongside those of the 193 member states. Pope Francis has signed U.N. Secretary-General Ban Ki-moon's visitors' book as he visits the world body's headquarters. The pontiff took a white card from his pocket and copied a lengthy message into the thick, bound book in the secretary-general's conference room. The secretary-general also showed the pontiff a Norman Rockwell image on the wall. It's called "The Golden Rule" and bears the famous words: "Do unto others as you would have them do unto you." About 400 U.N. staff gathered in the Secretariat lobby to greet him for a "town hall" meeting in the lobby. Pope Francis has arrived at the United Nations for a speech that will bring his message to an international audience. Secretary-General Ban Ki-moon and his wife, Yoo Soon-taek, met the pontiff as he arrived at the world body's headquarters in New York. The Vatican has said Francis is expected to discuss the need for peace, the plight of refugees and the role of poverty and bad government in driving conflict and migration. But inequality, poverty, the environment and religious persecution may also be among the issues he highlights. The Vatican flag is flying for the first time at the United Nation, raised without fanfare or ceremony just before Pope Francis arrives to address the U.N. General Assembly. U.N. security officers raised the Holy See flag with its yellow and white bands and a triple crown topped by a cross on a new flagpole set slightly apart from those of the 193 U.N. member states. The General Assembly overwhelmingly approved a Palestinian sponsored resolution on Sept. 10 allowing U.N. observer states to fly alongside those of member states. The Holy See and Palestine are the only two U.N. observer states. Archbishop Bernardito Auza, the Holy See's United Nation's ambassador, told a news conference earlier this week that the Vatican changed its decision not to have the flag fly for the pope's first visit to the United Nations at the recommendation of the U.N. Secretariat. But he said the Vatican did not want any ceremony - just to have the flag raised after all the member states, as the resolution says.